Nan Zhang inside Kogod. Credit: Will Diamond. Around the world, countries are working to enhance data privacy protections as privacy breaches continue to come to light. The European Union (EU) recently passed a regulation that aims to harmonize privacy laws and reshape how organizations approach data privacy. The General Data Protection Regulation (GDPR) was approved and adopted by the EU on May 15, 2018, and while it strives to protect consumers’ private information, it also poses a challenge to businesses that must comply with the new regulation. Companies that handle personal data must provide privacy safeguards by default (e.g., using anonymization where appropriate), so that the personal data will not be disclosed without explicit, informed consent. This aggregated de-identified data, is based on a general definition of an outcome that the data that can no longer be linked with an individual customer. The problem with this definition, Zhang argues, is that every company has to make their own judgment call on whether the outcome was fully achieved or not. Complicating matters further, it’s difficult to predict all of the potential ways data could actually be linked to a customer in the future. Zhang’s previous research on data analytics aimed to answer whether data can actually be stripped of all personal identifiers. Regulations like the GDPR may not alleviate our concerns on data re-identification or data inference, but it will give consumers the chance to explicitly consent to businesses using their data for specific purposes. And consumers, Zhang says, are still responsible for their information as they download apps and use services. Zhang’s research runs the gamut for finding answers to these information privacy questions via the lens of data analytics. 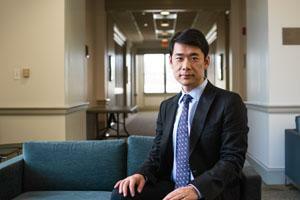 Through a National Science Foundation grant, Zhang and Kogod professor Heng Xu are conducting research on past consumer privacy choices that lead to privacy regrets. “Situation-Aware Identification and Rectification of Regrettable Privacy Decisions” helps users revisit and rectify these past decisions on information disclosure by identifying which choices they are most likely to revisit. Instead of pushing a notification out for each app, Zhang and his team determine which app’s data permissions a user might revisit most in the future through an analytical approach. Once determined, notifications would only be sent out about the apps believed to be associated with privacy regret. Data protection isn’t just up to the consumer. Zhang predicts that in the future, companies will have to responsibly store data if they want to have a good relationship with their customers and that the GDPR may be the first step to building that trust. Since the GDPR has only been around for about six months, there’s no telling what it will achieve as businesses begin to comply with the regulation. So, what was the last app you downloaded? If you can’t remember, you might want to check your privacy settings.